Sarah Hartford, central character in Trust Your Heart. We were first introduced to Sarah Hartford in The Red Heart, when she met the train bringing Kathy Sullivan to Alice Springs. The two women became firm friends, and Sarah supported Kathy through the turbulence of her relationship with Alex, and of course in the aftermath of the accident. We learnt to appreciate her as an empathetic friend, but one with an irreverent sense of humour. It wasn’t apparent the extent of the sadness she was also carrying. In Trust Your Heart, we learned that in spite of the bubbly persona, there was a fragility underneath. Sarah was cautious about putting herself in a vulnerable position where Joel was concerned. Sensible woman. Over the course of the story, we saw the growth she experienced, realising she was in charge of her life and it was up to her to make the good things happen. I’ve taken this opportunity to interview Sarah and get to know her in greater depth. You were initially a city girl. What brought you to Alice Springs? It was a mixture of the job and looking for a bit of adventure. I’d always wanted to explore this area of Australia, and of course to visit Uluru. I was getting bored in my last job, so when I saw this position advertised, I jumped at it. It was the right move. It must have been devastating for you after Dave Bishop died. What kept you in the town? This was where Dave was buried and where I felt close to him. Also, I had a strong support network in Alice Springs, and really enjoyed my job. It didn’t occur to me to leave. You and Kathy Sullivan were very close. Have you ever been tempted to take up flying yourself? Not really. Until I got this job in Alice, I didn’t have any connections with aviation, so as a career it didn’t really feature for me. When I was small, I thought I would be a trapeze artist, but had neither the aptitude or the figure for it. I fell into administration, and it’s worked out to be a good fit for me. I like organizing things. We saw how you organised the teams for the Henley-on-Todd Regatta. Will you train a women’s team next year? Now that’s a thought. I’d have to think up different strategies to get the best out of the women. It would be really cool to have both male and female winning teams. Things were a bit rocky there between you and Joel for a while. Will this relationship last the distance? I can’t definitely answer that question, but we’re on a much stronger footing now. There are no secrets between us, and I feel he has my back. He supports my flamenco dancing, so that must count for something! Have you met his family yet? I’ve met Sam obviously, as he stayed with Joel for a couple of weeks. I haven’t met his sister yet, but she has a visit planned for next month. I’m really looking forward to meeting her. I used to watch her on TV when she was competing, so seeing her in person will be a thrill. She’s one who could have been a trapeze artist! Are there wedding bells in the future? I haven’t asked him to marry me, so who knows. We’re enjoying this time of getting to know each other better. It’s certainly an option. Joel has a three-year contract with the radio station, after which he could be posted anywhere. That might be a precipitating factor for any long-term decisions. 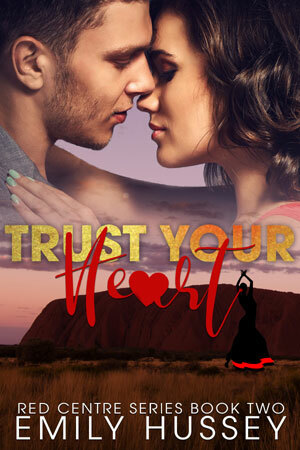 You can obtain a copy of Trust Your Heart in print format from the the Book Shop page on this site, or in eBook form from Amazon, or your favourite eBook retailer. Don’t forget to leave a review. It helps future readers. Not long ago, I launched The Red Heart. Initially, I intended this to be a stand-alone book, featuring Kathy Sullivan and pastoralist Alex Woodleigh. The book also described the secondary characters – Kathy’s friend Sarah, the chopper pilots Chris and Mark, and Melissa Gilbert who featured strongly in the aircraft disaster. In writing that book, I got to know some of those secondary characters to the point where I wanted to know more of their story. It was only natural to focus on Sarah to explore her life. What was she doing in Alice Springs? What happened with her and Dave Bishop, and how was she coping in the grieving process? She is lucky to have Chris and Mark to help her through some of the dark days. Sarah’s social circles largely revolve around the aviation sector, but not exclusively as we discover in the final hours of the wedding celebration for Kathy and Alex. Sarah meets Joel Pemberton under circumstances she would rather hadn’t happened, and from there her horizons expand. Sarah is a forthright and bubbly character, but that is the persona that is visible to others. Underneath, she experiences the insecurities, doubts and loneliness of someone who feels that commitment is not to be trusted, and that happiness is passing her by. The story follows her development as she makes the transition from grieving to accepting she does have a future. Here is a small extract from the book. Here is a small extract from the book. She looked around. Who was that? Where had the voice come from? Tomás kept hold of her hand, looking also in the direction of the voice. The figure detached itself from the tree and moved into the light. Joel. In the dim light, he looked brooding and menacing, momentarily startling her. This was not the Joel she knew. What was he doing here? There was no faulting the grapevine. Chris would have told Mark, and Mark in turn had told Joel. Now they were under the lamplight, the initial perception of moody and ominous disappeared. The man in front of her looked tired perhaps, but still with the charisma that had first drawn her attention. He also looked pleased to see her. That was encouraging. Those secrets again. Was he hiding something, or did he not trust her? “Hey, that’s fine—I wasn’t meaning to pry into your personal affairs.” She half expected someone to jump out from behind the door crying “Liar! Liar! Pants on Fire!” Of course she was curious. Good manners dictated she shouldn’t stick her nose in. “You’re not prying, Sarah. It’s not something I can talk about.” Abruptly, he changed topic. A zillion thoughts chased each other through her mind. She’d mentally decided that theirs was a relationship that was going nowhere. He had no right to stir things up, just when she thought her life was getting back on track. He was close enough that she could smell the scent she now identified as his. That, and the proximity of his body evoked a reaction she hadn’t been expecting. The tingling in her breasts spoke of her own arousal. He looked at her with intensity, a hunger even. It mirrored a need in herself. Wrapping her arms around him, she lifted her face to his.